Read the article about the XL version of the TouchDuino . The source code (arduino sketch) is availble from there. It is now possible to build a 128 touch sensitive keyboard with one Arduino Uno and eight MCP23017s which are really cheap as one of them costs about 1 Euro. So you can built your own touch sensitive musical instruments with up to 128 inputs. 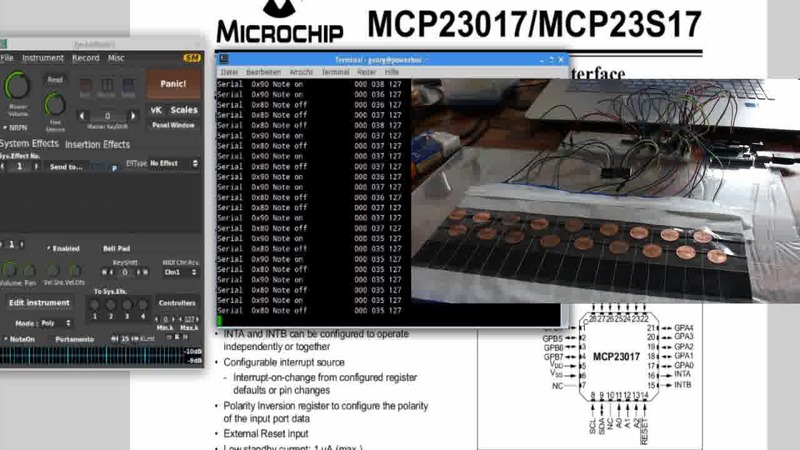 Does the TouchSense Arduino library work on a MCP23017 16 bit I/O expander? To give you the quick answer: Yes, it does. Because the MCP23017 16 bit digital I/O expander runs via I2C and gives you additional 16 GPIO pins you can use max. 128 touch sensitive input pins. There are three address pins on each of these chips that allow you to add maximal 8 of these devices to the I2C bus. It was not a trivial task to port the TouchSense library from the first project to work togehter with these chips, but today I wrote a basic library with example code for the Arduino that gives you some insight in this process.